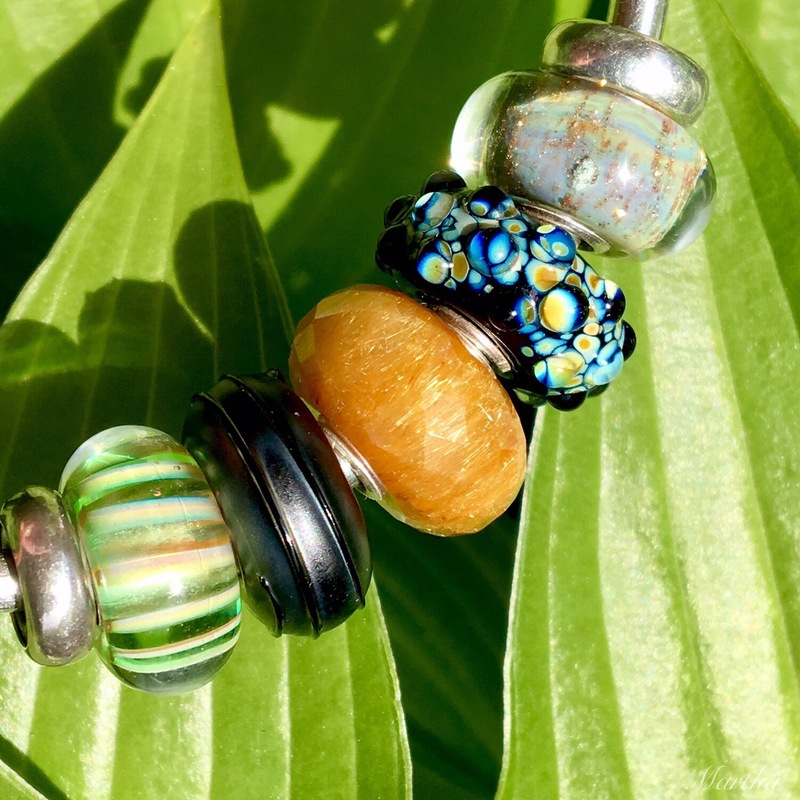 On Saturday, June 17 it will be Trollbeads Day and this year’s Limited Edition bead is a Golden Rutilated Quartz, retailing for $170 USD/$221 CAN. I received a stunning example, with lots and lots of rutile pieces that look like spun gold. I first tried to go for an organic look by putting the Golden Rutilated Quartz with two beads from the Rocky Beach Kit. That’s Fossils on the left and Pebbles on the right. In between the beads are two Sunbeam Spacers. For a classic, neutral looking combo I used two beads from the Winter Wonder Kit. On the back bangle are two pearls and a Black Onyx. 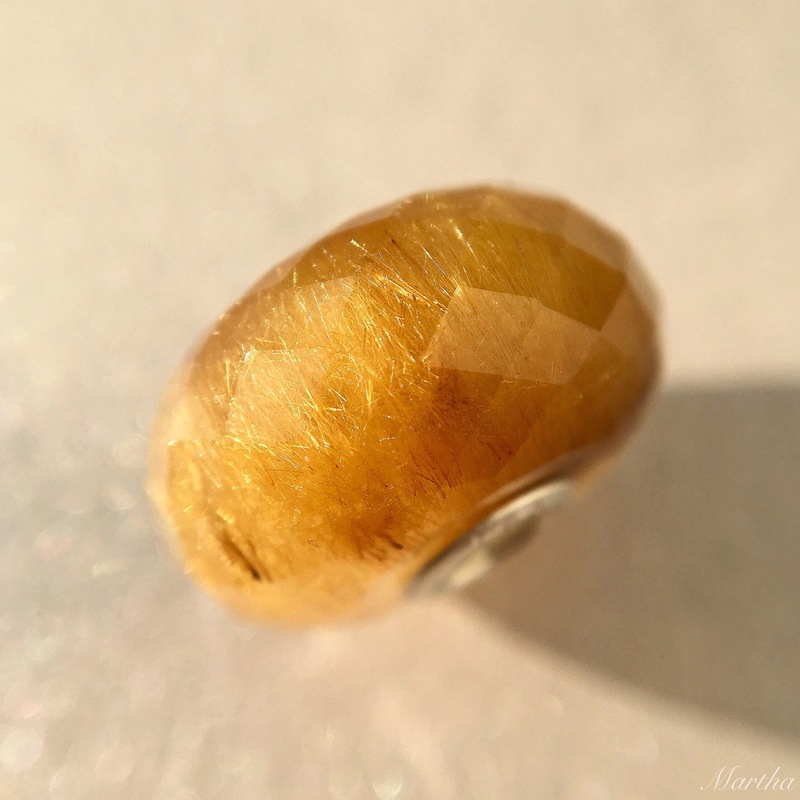 I thought the Milan bead I have would pick up the golden honey tones of the Golden Rutilated Quartz. On the top is Rainbow Bridge and on the bottom are Wise Bamboo and Black Silk. 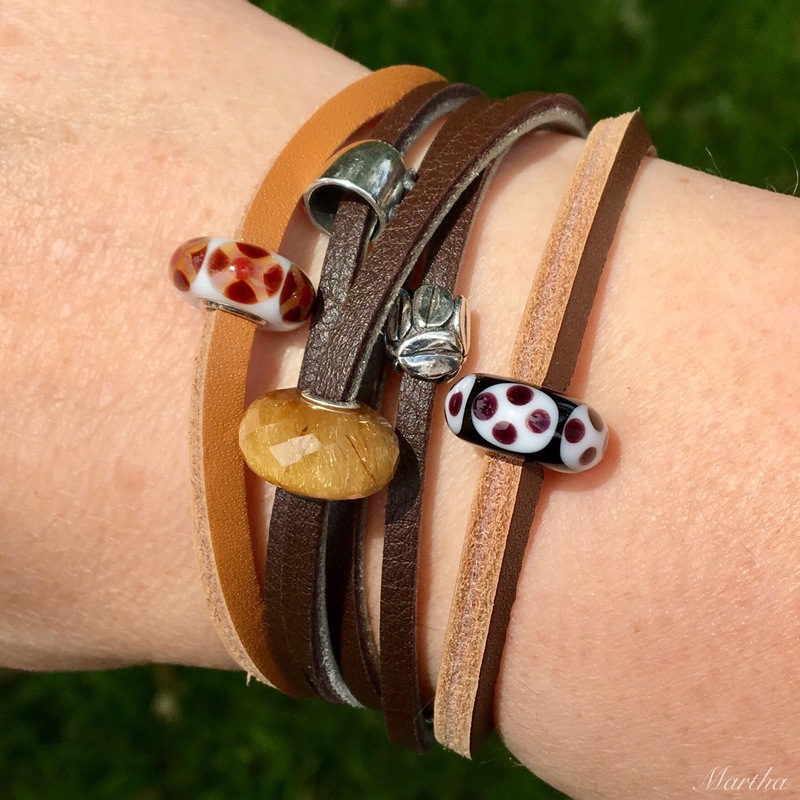 Next up is a warm, coffee inspired look, using some of the Unique Leather Bracelets plus the Brown/Light Grey Leather Bracelet with the Mocha and Coffee Mug beads. 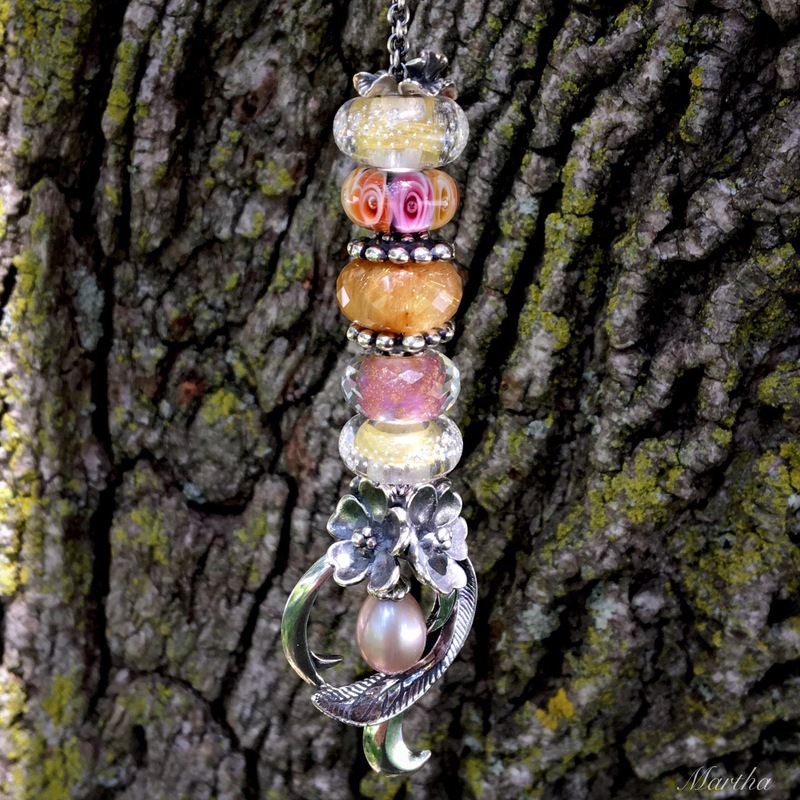 I wanted to try the Golden Rutilated Quartz bead with my Rosa Pearl Fantasy Necklace. Top to bottom are Fantasy Hibiscus, Gold Silver Trace, Roses for Mom, Lotus Top, Golden Rutilated Quartz, Lotus Top, Pink Delight Facet, Gold Silver Trace, Apple Blossom Pendant and the Freedom Feather Pendant. Here is the same necklace but inside and heavily filtered. 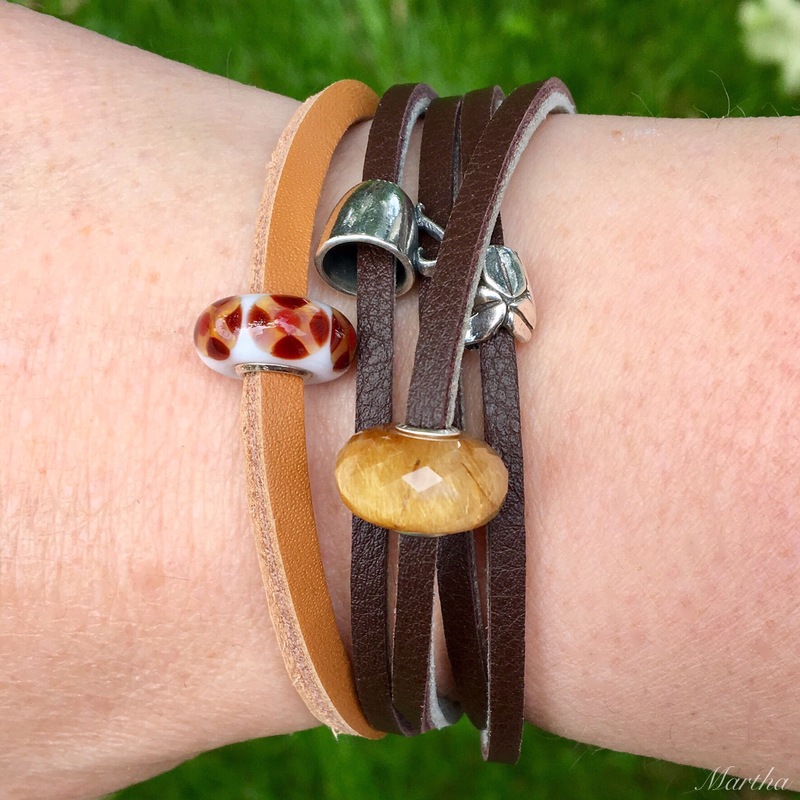 When I matched up the bead with others in my bead box, the Mysterious Ways Kit seemed to blend in so I made up a bracelet using most of the kit plus a few other beads. 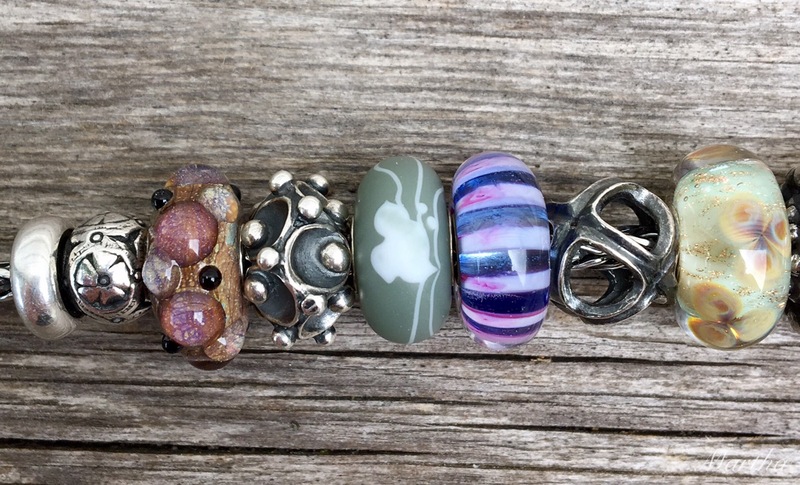 Below left to right are the silver bead from the Feel Good Bracelet, Pebbles, Water Lily Family, Tsuru, Violet Stripe, Rise Together and Floral Wishes. Below left to right after the Floral Wishes are a Lotus Top, Golden Rutilated Quartz, another Lotus Top, Wise Bamboo, Symphony of Hearts and Wild Flowers. Below left to right after the Wild Flowers are Rainbow Bridge, Moonlight Dancing, Fossils and Rhythm Drum. Here’s another full bracelet using purples, black and gold tones. 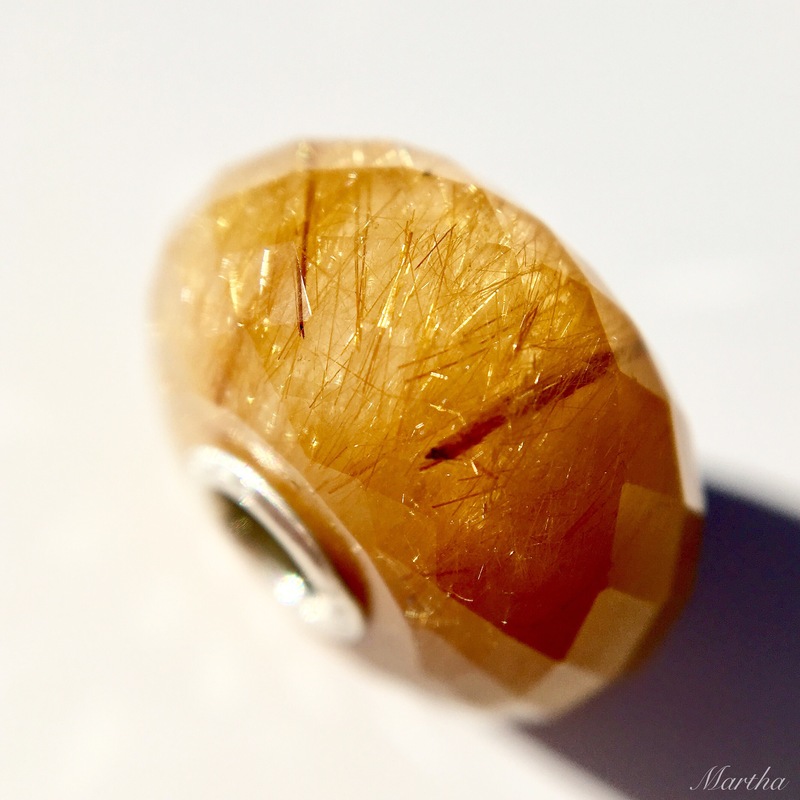 Lastly, here’s a short video clip showing how the Golden Rutilated Quartz sparkles in the sunshine. You can also see the upcoming Dancing Butterfly Spacers which arrived yesterday! And here’s a bonus picture of the Dancing Butterfly Spacers. They are super cute and will be coming out June 30. 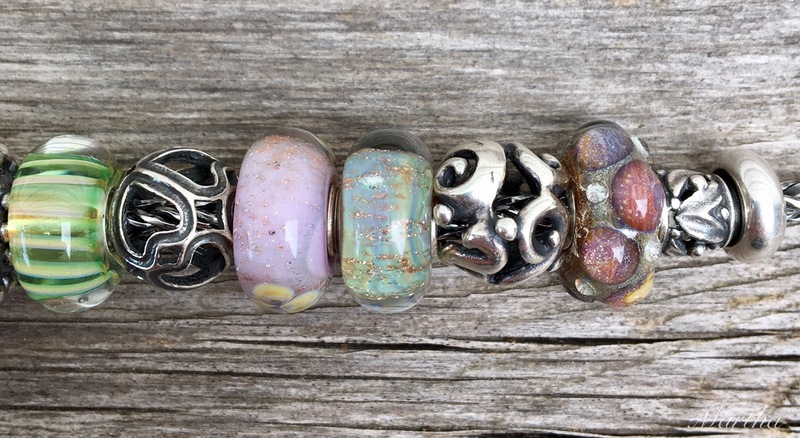 I realize that the Trollbeads Day bead is not inexpensive, but I sure had fun playing around with it. There are so many different variations of it, from very clear examples to more densely packed ones like mine. Do look up @trollbeadsdanmark on Instagram as they have some fantastic pictures. 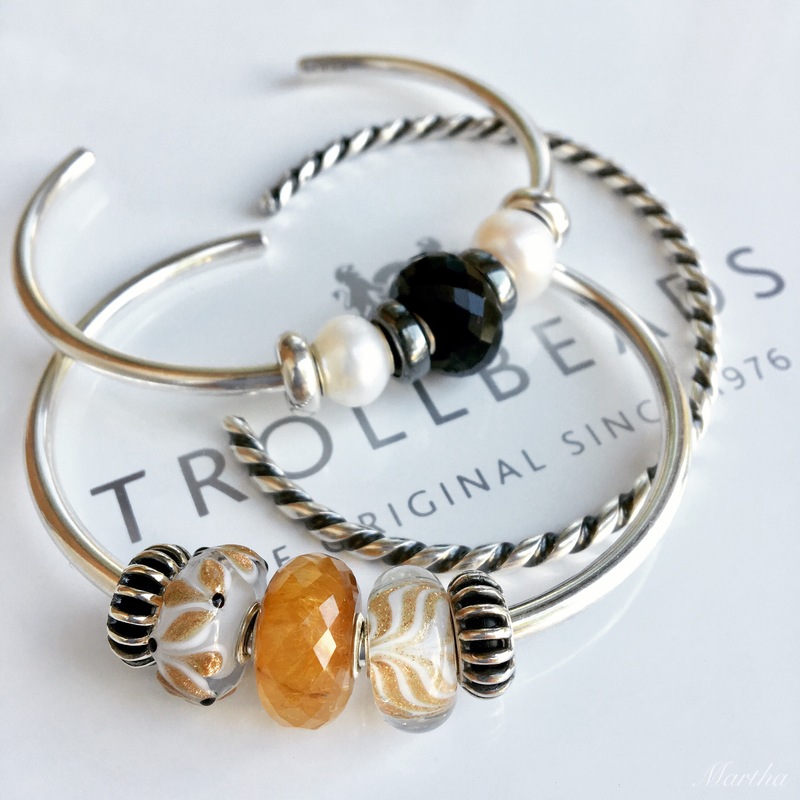 If you are going to a Trollbeads Day celebration have a super time!! 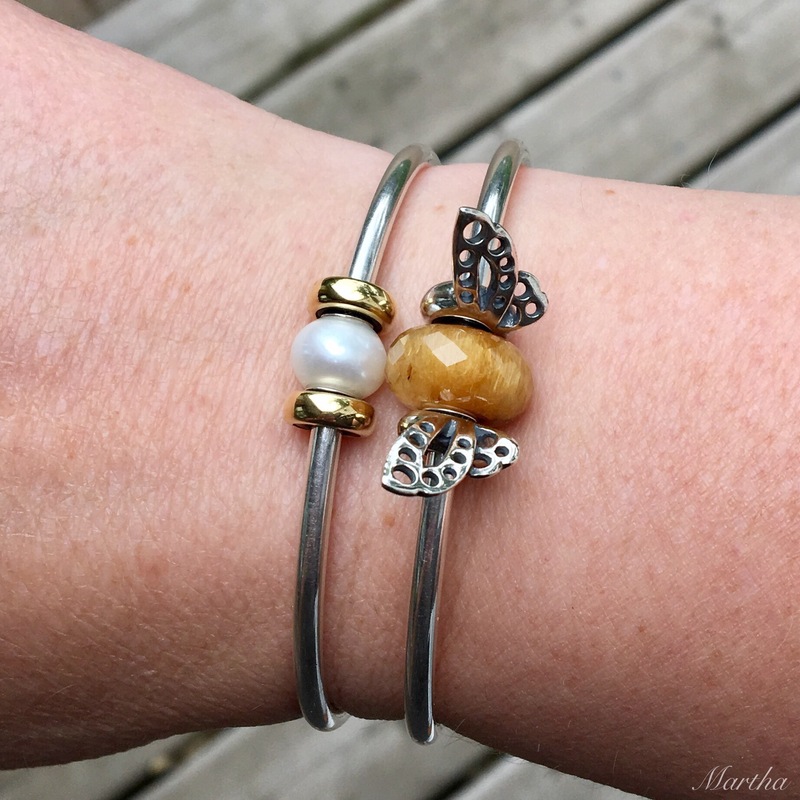 I absolutely adore the bangle with the two Winter Wonder beads but your other pictures are just as lovely and show this bead’s versatility. I don’t think I will be indulging but I’m going to my local Trollbeads store this Saturday for the 2017 Trollbeads Day event. I hope you have lots of fun at the event and please post pictures as I will live vicariously through you that day! 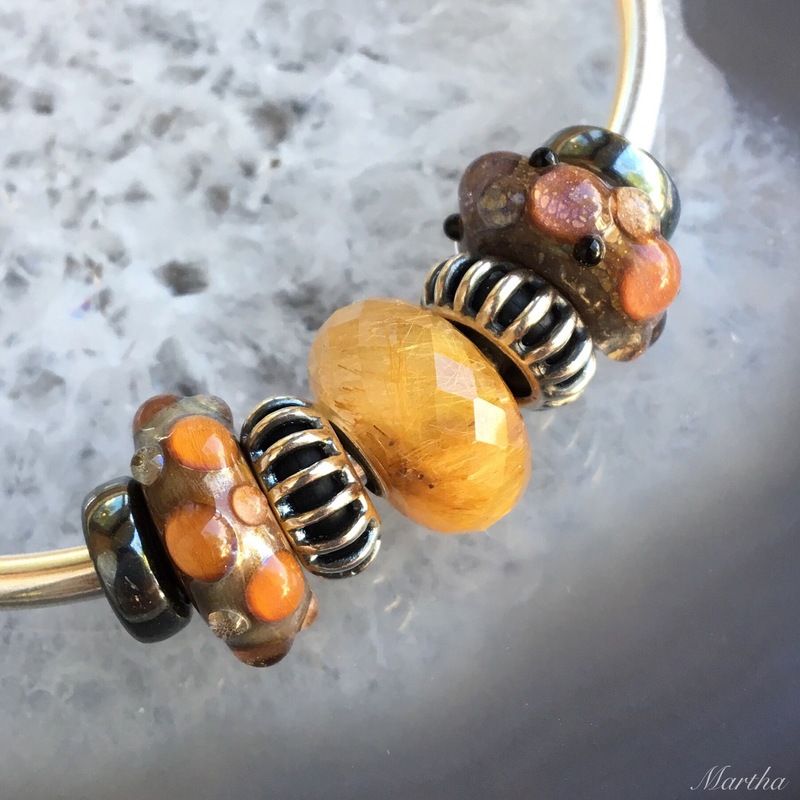 This bead really is a beauty and I love how you styled it with browns and the Rocky Beach beads. And yes. I caved in and got one. I’ve just seen so many pretty pictures that I’d kick myself if I didn’t. Can’t wait to see your pictures Samantha! Ooo-what does the one you picked out look like, Samantha? Funny you should ask. I have no idea! I picked it out, but can I remember what it looks like? Absolutely not. Lol! I’ll be as surprised as you are! Oh this stone can do no wrong, it is stunning. Too bad the price is also stunning 😦 although I won’t splurge it is great to see it on others wrist and all the lovey combos people have made. There really isn’t one combo you created that I don’t love although I think I prefer it on a silver as opposed to a leather because it seems to bring out the sparkle and shine a bit more. Those butterfly spacers are so cute !! Absolutely gorgeous, Martha! 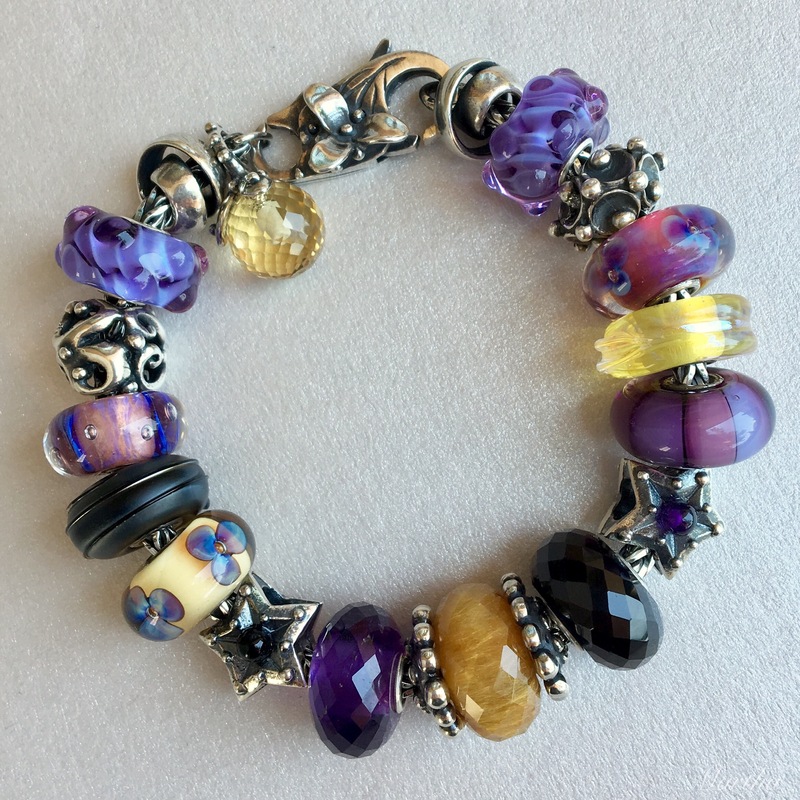 I love your full bracelet with the purple, black and gold beads. I debated ordering one of the darker color ones, but I didn’t do it. There’s so many things I want to get, and I just couldn’t get past the cost. Doesn’t mean I don’t like it, though!. 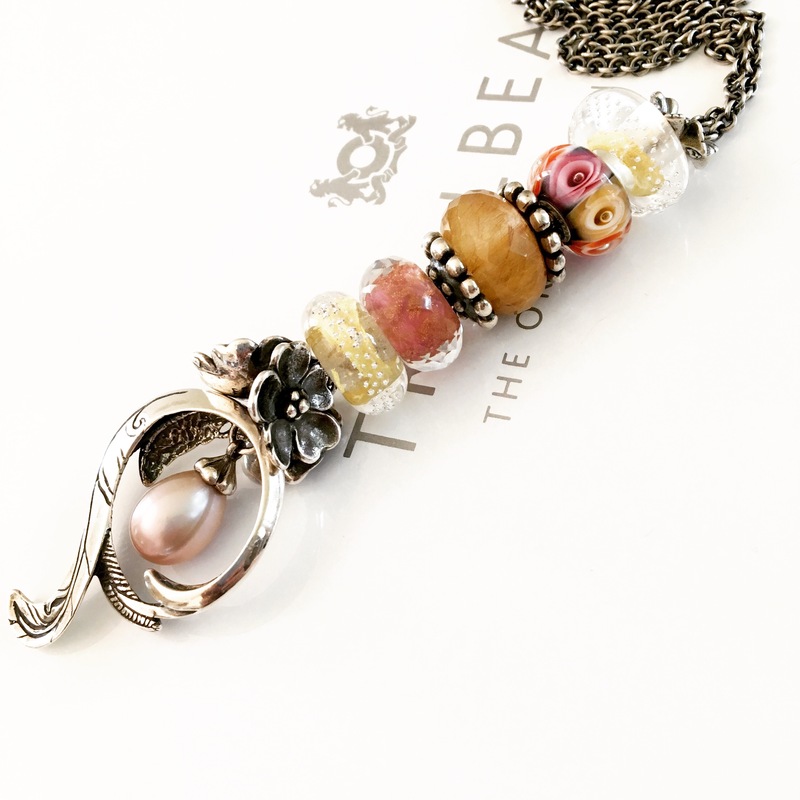 I looked up the Trollbeads Rosa Pearls and they are beautiful!!! I don’t have any pearls at all… yet. And I forgot to mention that you have helped me to make the final decision that I DO want gold stoppers. 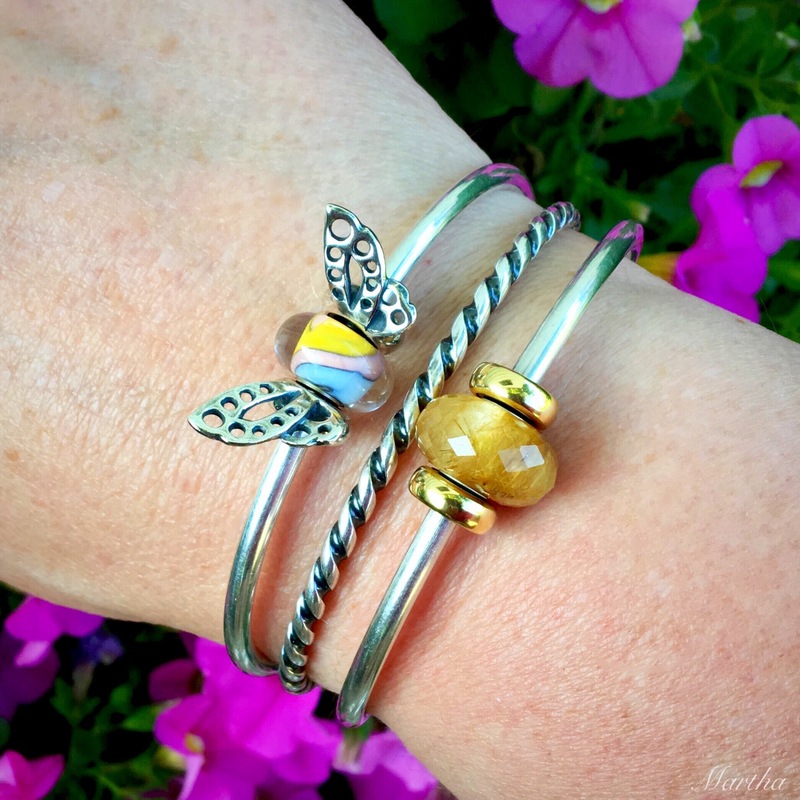 I wasn’t sure if I would like them with the silver ( cannot afford a gold bracelet! ), but they look great. I don’t know if I can take much more of this goodness, Martha! Thank you for the photo. My pleasure, Suzanne! Have a great weekend! I am so in love with this bead. I wish it was part of regular stock and not limited edition. Even though it is pricey, I would like one just like yours because it matches the color of my sons hair. I have a tiny tin filled with his first hair cut curls. The tin has a clear lid. When you did the video it seemed like I was looking into that tin (though my son’s hair isn’t quite as sparkly 😉 Thank you so much for the video and accurate outdoor lighting. I will save and hopefully find a more caramel bead before they are sold out. Oh, I just love that the bead reminds you of your son’s first hair cut! Would you believe that I still have some hairs from my first hair cut in an envelope? I think your idea to save for a special bead is a good one and it’s something I’m trying to do these days. I walked right by the Pandora store at the mall without going in, as I have some bead goals I want to save up for. I hope you are able to find a caramel coloured bead. Thanks for reading! Like it with Winter Wonder kit. When I look back at the photos I think that’s my favourite too. Ooo-that would be exciting! 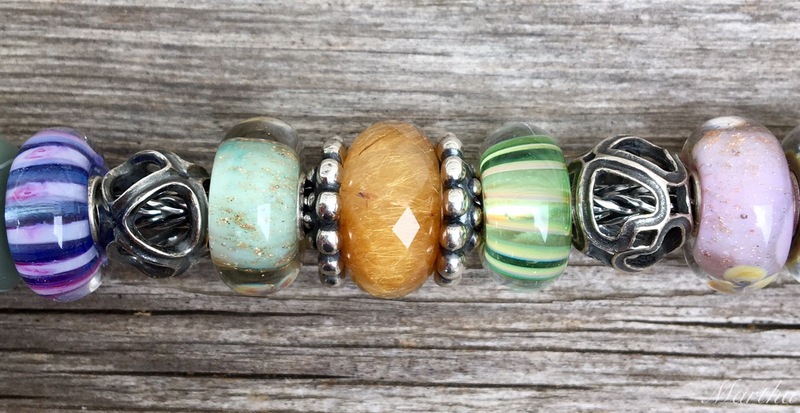 And I’m impressed that you can buy Trollbeads in Nanaimo!! There is nothing within two hours of me! Have fun! I got mine today! It is clear with lots of golden rutiles, and it’s beautiful. 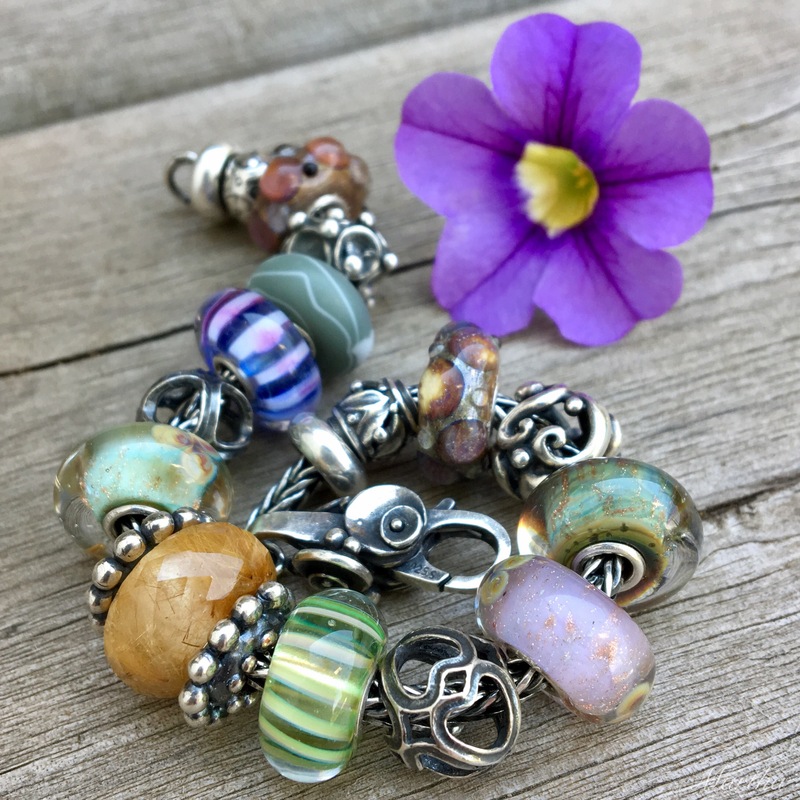 It really is cool that we have a Trollbeads dealer here, in fact they are a Premium Plus dealer so they have it all!!!!!! That’s fantastic! To be fair it’s maybe good there is no dealer in my city because then I’d always be stopping in for ‘maybe just one bead’. LOL! So awesome though that you are able to choose them in person!